There's nothing more tragic than the death of a child, and when a child dies by suicide, the heartbreak can only possibly be dwarfed by the intense confusion around the question of "Why?" But in the devastating case of 12-year-old Mallory Rose Grossman of Rockaway Township, New Jersey, the answer to that question, according to her family, is simple enough for a one-word answer. Mallory was an active cheerleader and gymnast who had three siblings (two sisters and one brother) and was enrolled as a 6th-grade student at Copeland Middle School. On June 14, 2017, her mother paid a visit to the school — again. But by then it was too late. Mallory passed away later that same evening. Now her parents, Dianne and Seth Grossman, are fighting for real changes to be made in Mallory's name. According to NBC, the grieving parents announced that they are "suing the school district, saying Tuesday that administrators were negligent in preventing abuse that led to their daughter's death." 1. The lawyer's statement on behalf of the family. On Tuesday, August 1, 2017, both of her parents were present at a press conference announcing their law suit against the Rockaway Township School District, where attorney Bruce Nagel spoke on their behalf. Nagel shared that "the family is filing an intent to sue Rockaway School District and all the administrators who 'ignored months of pleas' from the family.'" 2. Mallory's mother believes the popular cheerleader was bullied because other children were jealous of her. Later in the press conference, her mom shared her own thoughts about the reason her daughter was singled out for such mean-spirited behavior. "Mallory was a quiet child. She was a good student. And I think that she kind of represented what they couldn't be, and so, therefore, she kind of had a target on her back." 3. In addition to seeking help from the school, her mother had reached out to mothers of the children who had been harassing Mallory. "I can tell you that the mother dismissed it, said it was just a big joke, and that I really shouldn't worry about it and... she was very defensive and defended her daughter. Even after I asked her daughter to please stop texting Mallory, three minutes later a text message, a series of text messages, came through from that child." On June 17, 2017, Dianne made this anti-bullying message her cover photo on Facebook. The intro to her page now reads: "I am heartbroken. My new 'why', is so that no family will feel THIS pain. I am Mallory's Army!" 4. The bullying was constant and relentless, and it simply wore the beautiful little girl down. Her mom shared specific examples of both the behaviors her daughter endured, as well as the effects the stress of the constant emotional assault took on her. "She just talked about how horrible it was at school and that it was the dirty looks and the constant harassment and the name-calling and the cold shoulder. The exclusion, I think, played an important role in all of that and so, you know, removing herself from the situation was a part of the problem. And then we did that and then the school put her back into the same classroom in the same situation. So, you know, we were in contact probably almost every month with the school following up, staying on top of it. It got to the point where she didn't want to go to school. Chronic headaches, stomachaches, not feeling good..."
It appears that a good deal of the abuse Mallory endured took place on SnapChat, but that was far from the only vehicle through which the girls who tormented her kept after her. 5. A GoFundMe page was set up to cover the family's funeral expenses. As of the time of publication, $75,906 has been raised, far surpassing the initial goal of $20,000. The excess amount will be distributed at a later date to charitable causes. 6. The school's response so far. Rockaway Township School District Superintendent Greg McGann issued only a fairly vague statement after Mallory's death. "'As Superintendent of Schools, it is with deep sadness that I inform you our school community has experienced a tragedy. A middle school student died suddenly on the evening of Wednesday, June 14, 2017'... McGann said the death of the student is subject to an investigation by the appropriate authorities. 'This is standard protocol, and the District is fully cooperating with the appropriate authorities regarding their investigation... The District has implemented a wide array of support services for students, parents, and staff as our community copes with this tragedy." I did find a cafeteria notice, though, in case anyone is interested. 7. Those wishing to honor her memory have taken to wearing light blue. 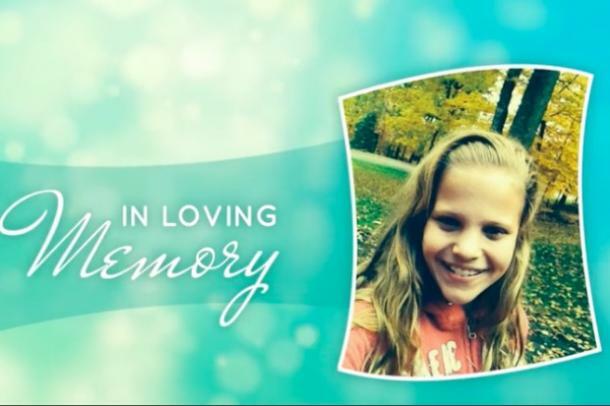 The Monday following Mallory's passing, her fellow students showed up wearing light blue. The color has taken on significance as a symbol for raising awareness around the dangers of cyberbullying and bullying in an attempt to stop this damaging behavior. In addition, hashtags #mallorysarmy and #blueoutbullying have begun to spread, as the Grossman Family's newly formed "Mallory's Army" spreads its urgent message as strongly and quickly as possible. Grief counselors were also made available to student and staff at Copeland Middle School, as well as at all of the local elementary schools. Finally, here is the text from Mallory's beautiful obituary, which is available online. "Mallory Rose Grossman has left this world a better place. Those who were fortunate to have known her and loved her are better people for it. Her beautiful and free spirit will remain with us for the rest of eternity. Every once in a great while, heaven sends down a teacher in the form of a child. Mallory was our teacher. She taught us how to love each other as only a child can. Although she has returned to join all of Angels in Heaven, she’s left us lessons for others to learn about. How we should love each other. The value of our lives, our families and our communities. Her purpose and impact on this world is beyond what we can see or feel. And everyone who takes her lessons are better for having done so. She inspired. She was kind. She was innocent. She was beautiful. And she was pure. Mal loved the outdoors and nature. She loved flowers, every color and shape. She was compassionate. She raised money often and would send every penny to her favorite charity, Camp Good Days. This camp provides summer camp experiences for children with cancer and children who have lost someone dear to them with cancer. Selfless. It was her giving spirit and love for all people and things that drove her to move mountains. Another lesson. Mallory was artsy and talented. She made jewelry (of course she sold it all to benefit Camp GooD Days) and was always crafting something. She was creative and very much an entrepreneur. She was gifted and wise beyond her years. Truly, an Old Soul. Her Family are her biggest fans! We ask that you continue your prayers for Mal and her entire family. Keep them in your hearts and minds today and always. 'When we love, we always strive to become better than we are. When we strive to become better than we are, everything around us becomes better too.'" If you or someone you know is suffering from suicidal thoughts, please seek help IMMEDIATELY by calling The National Suicide Prevention Line at 1-800-273-8255. There is hope!